A kids hoodie that's stylish, sassy and snuggly to boot, your little hoodlum will turn heads for all the right reasons in our Kids New Era Zip Hoodie. Kids Zip Hoodie is rated 4.2 out of 5 by 68. Rated 2 out of 5 by LP1976 from Disappointed I loved this tracksuit set when I first saw it so when it went on sale, of course I had to purchase it for my daughter! I was so disappointed to see after the first wear, the fabric had pilling and pulls especially in the areas her backpack was. Now after 3 or 4 wears the tracksuit looks old and very untidy. I understand kids are going to wear clothes down but not after 3 or 4 wears! Rated 4 out of 5 by Venn89 from Love the look and feel I just adore this on my daughter. The print is beautiful and eye catching. It feels silky smooth on the outside but textured inside enough to be soft and comfy. I love the lightweight feel. We can pair it with so many different outfits - it’s my go to jacket when dressing her. Only thing I would say is a negative is the stitching on the logo started coming undone after s couple of washes. Other than that, I’m so glad I bought this. 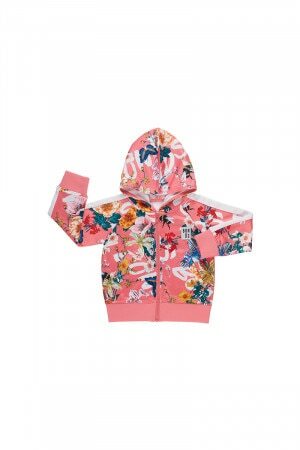 Rated 3 out of 5 by LisaDouglass from Gorgeous Pattern I absolutely love the bright, floral pattern of this jacket. There is no way I could lose my daughter in a crowd. It's super cute paired with the matching trsckpants too. My only issue is that the jacket and trsckpants are starting to get pilling and my daughter has only warn them twice. The jacket is also quite thin, so would be more suitable for Autumn rather than winter. Rated 4 out of 5 by MellyZ from So pretty! I bought one each for my girls and they look so adorable. Easy to match with others colours. I found the sizing quite generous so we will get quite a lot of wear out of them. The only thing I would’ve liked is if they were a bit warmer, the material is thinner than expected so needs to be layered. Rated 5 out of 5 by Nem1 from Stunning Purchased the set when it first went up on the website and so glad that I did, wasn't sure on it at first, the online pictures don't do it justice. It is a stunning Hoodie & the pants are just as nice. I love the feel of it and my daughter looks so gorgeous in the set. I want one for myself! Rated 5 out of 5 by Emerald from Best Buy! So happy with my purchase, the sizing is generous, my favorite print yet, amazing colors. Whenever my daughter wears this tracksuit set without a doubt we get compliments all day long and people asking us where we brought it from!